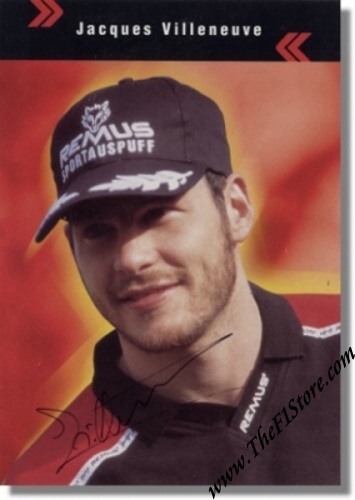 Jacques Villeneuve signed Remus Fan Card. This fan card, issued by German sports exhaust manufacturer Remus, was issued in 1998 after Jacques had clinched the 1997 Formula One Wold Championship. The card is signed in person by Jacques. It measures approximately 10 x 15 cm or 4 x 6 inches.